Hi, Friends! Boy does it feel like Fall today! As they say, ‘the frost was on the pumpkin’ this morning! When the temps drop, out come the cozy throws to snuggle under in the evening and we change up our fall clothing and accessories. So, I updated my front entryway to reflect the changing season with a new welcome sign. Did any of you notice that my interior doors have gone from white to black? I kept waiting for someone to comment on that in my Fall home tour! I have the first floor completed, but I may wait until after the holidays to begin the second floor doors. Tomorrow, I’ll be sharing more about the process and why I made the change. I found the rusty looking metal arrow at one of my favorite local shops. I knew I would find a spot for it. As soon as I got home, I held it up above the DIY coat rack on the entryway wall and it was the perfect size! The welcome sign with antlers is a new item I’m adding to my Etsy shop. You can purchase it HERE. Something else new in this shot are the curtains. I still haven’t quite decided if they are staying? I need to think on it for a few days before I make a final decision. They are from Pottery Barn. I actually found them at the Pottery Barn Outlet a few years ago and haven’t used them yet! They were such a bargain that I couldn’t pass them up at $14.99 per panel! 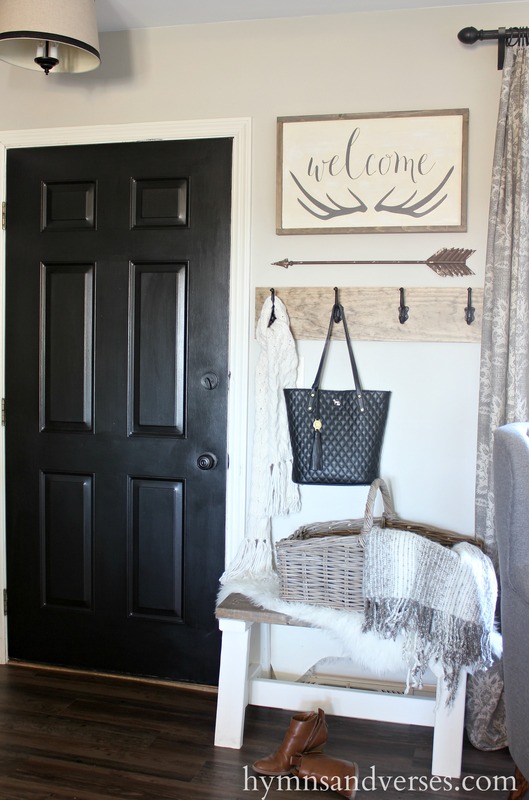 Thanks for stopping by to see my fall entryway with the new welcome sign! I hope you are having a great week! Click HERE to see more fall decor, fall home tours, fall crafts, recipes, and more! I love the black doors and I do like your panels! I absolutely LOVE the sign and the arrow! And the curtains are so pretty. Funny–I just painted my two exterior steel doors black this past weekend. 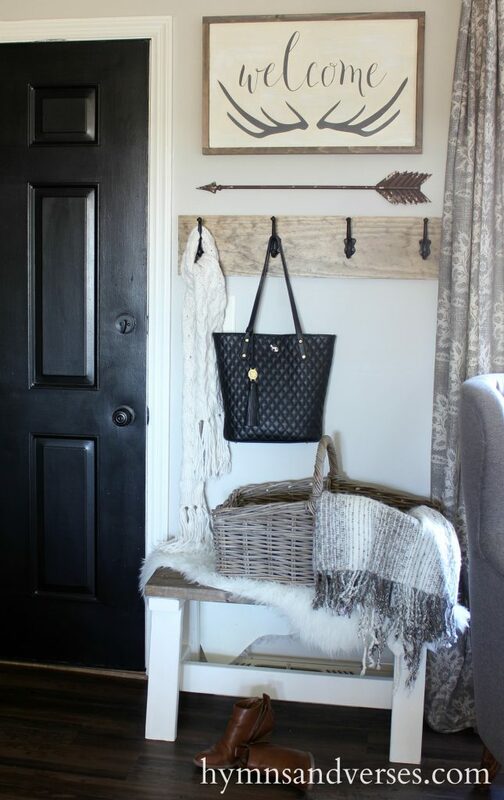 Your entry way is so beautiful! I love it! I have short term memory loss so I admired your doors but it is hard to recall details. Are they new or not. But with your color scheme I really like them. I like how you whittled out an “entry” area in the perfect spot. The arrow and sign complete the look. But the peak of curtains really sparked my interest. They look so West Elm of right now!!! They add the subtle design to what could be tome on tone. I read drapes were out. I don’t care!! I live where it is HOT. I need a shade that louvres or my rugs and furniture and bedding fades without the louvres. I need drapes lined to also hold in heat in winter and hold out sunlight in summer. So I’m partial to my lined drapes although because a small tree shades my bedroom window I get by with sheers in summer. Please decide on your own what you like but as a reader? I do like your drapes peeking out??? I’m in the process of painting various shades of grey in my home. I have thought about black doors-love yours! What color is the wall? Love everything! 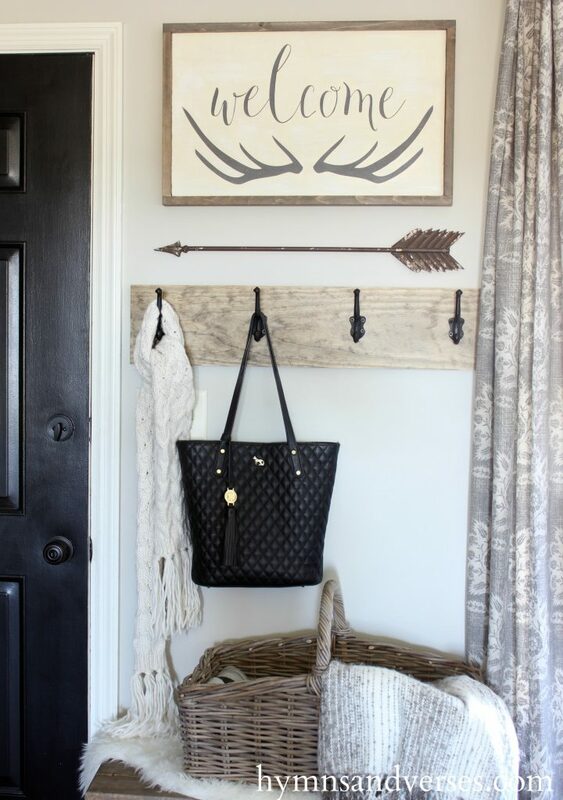 I’m in love with this entryway! I am trying to find things to decorate mine, and yours looks like the perfect measurements as mine! Where did you find your bench and how long is it? We actually made the bench.